Eradicating Extreme Poverty and Hunger is the number one Millennium Development Goal of the United Nations. One of the most effective ways to get involved in addressing this global issue is to start on a local, community level. The InterExchange office is located in one of the largest and most populous cities in the world. According to the Coalition for the Homeless, there are more than 55,000 homeless people in New York City. A lot of New Yorkers in need depend on charitable food programs, which are available to them through local soup kitchens and food pantries. These vital organizations depend heavily on the help from volunteers to service the community and make sure that no New Yorker is hungry. 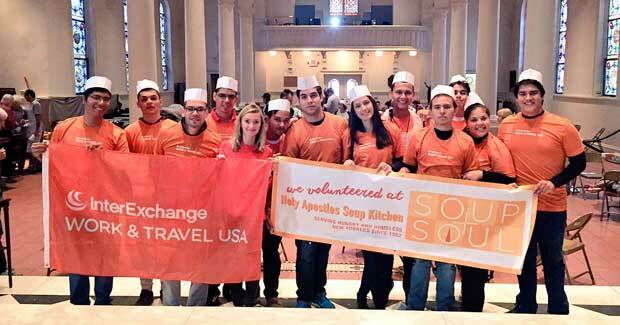 This winter, InterExchange partnered with New York’s largest emergency food program, Holy Apostles Soup Kitchen, and invited our Work & Travel USA program participants from Paraguay and Costa Rica to join together with New Yorkers for a morning of volunteering and learning. We served 10,000 meals that day! We also volunteered at different stations: food and beverage, social services, and cleanup. One of our participants shared with me that she volunteers regularly at a local food bank in Paraguay and the set-up is quite similar to the one at Holy Apostles Soup Kitchen. One student commented that “it was very nice to serve people in need, to see them smiling and enjoying some food. It was a pleasure to help others.” After our busy morning, we all enjoyed traditional New York City pizza and discussed the issues of hunger and poverty in New York City, the U.S., and abroad. This experience showed our participants how they can make a change on a global scale by joining volunteer projects in their U.S. communities and back in their home countries. Perhaps, some of them will bring this experience home and will volunteer at – or even start! – a local soup kitchen!